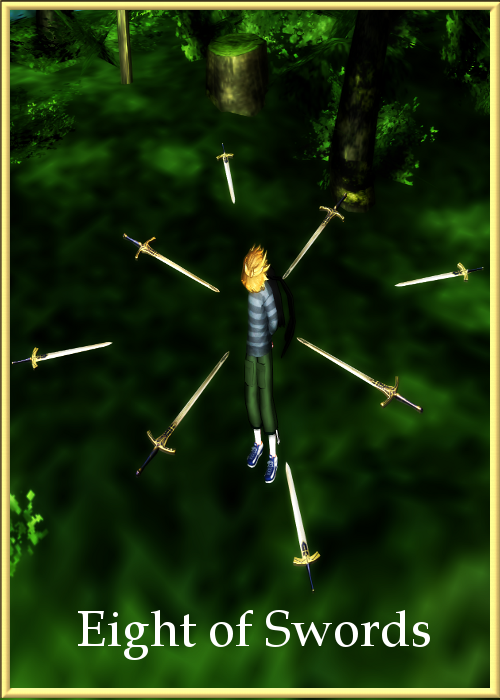 The Eight of Swords is the eighth card in the Swords Suit of the Minor Arcana and presents the seventh challenge of the suit. I often wonder if the situation of feeling stuck, confused, or trapped is a results of the avoidant behavior warned about in the Seven of Swords and echoes the Two of Swords as yet another possible result. If we are willing to face the things at hand, we can address them. We can’t close our eyes, pretend everything is fine, and remain boxed in forever. Eventually we’ll need to do something. Sometimes the only way out is through. Now as a writer with everything we’ve gone over with this card what comes to mind? Start writing! Doesn’t matter what it is. Stretch your mind and let The Eight of Swords speak to you.